Today’s demo. Freezing cold and rain. Man on crutches told to apply for a job emptying bins for the local council. OK, today wasn’t a good day. To start with the rain was relentless and it felt as cold as early spring. The atmosphere emanating from the Jobcentre was much the same. I arrived at ten on the dot and was greeted by a queue of people waiting for their food parcels. Luckily Gordon had just arrived and I could hand them out straight away. People really don’t want to be hanging around in the rain and cold when they are hungry. I had a good chat with them all and made sure that they were as OK as possible. I got a few hugs and handshakes. This really cheered me up. It takes time to build up trust and we are in it for the long haul. We also had a good chat about voting and the importance of it. Because I’ve been doing this for nearly 4 years I’ve seen a few elections. Normally people can’t be bothered to vote, but this year is very different. Most of the people that we spoke to are now going to vote, and they realise the importance of this. Personally I’m praying that labour win because it’s very hard work doing what I and the team do. I want to see an end to people’s suffering. To be quite honest it makes me very angry. For new readers that haven’t scrolled down, we’ve seen so many awful things. We have heard of people that we had helped committing suicide, attempted suicide, people becoming ill and everyone is suffering.? Why would anyone wish that on anyone else? Tories find this very easy of course. What is shocking me more and more every week is the amount of older people having to use the Jobcentre and the amount of obviously very disabled people being wheeled into the Jobcentre. These people deserve respect but the DWP gives them none. Here’s a lady being pushed in by a member of her family. It’s disgusting. I took the video on their way out because I was busy when they entered. Today was very busy but obviously people were wanting to get out of the rain so were rushing. We spoke to a man who had been on crutches due to a long term disability. He was told by his adviser to apply for a job as a bin man. Yes over three years later and I’m still hearing stories like this. Nothing ever changes does it. Our food parcels were gone within half a hour, all to hungry people desperate for something to eat. No decent government would allow this to happen to people. But the government actually likes this, I’m sure that they revel in their cruelty. I spoke to lots of people, many older men who are very frustrated and angry. One man in particular who had failed his esa medical and we had to calm him down and give him food. I told him that I understand his anger and I really do. It’s awful that he’s suffering like this. To say I’m angry at the system is an understatement. I’m not sure if I can handle another five years of this, I suppose that I will have to but financially I can’t take anymore really. As a single parent I’ve been targeted myself by this government so believe me I can relate to how people are feeling. Luckily today four friends came and said hello. They brought a coffee over with them which we shared. Being freezing cold it tasted really nice. A friend called Andy popped round to say hello. He’s a fantastic electrician, bit random to mention but he’s self employed and I can attest to how hard that is myself so I’m giving him an un ashamed plug. He’s called Andy Spark on Facebook and he helps out every now and then. A much valued member of the team Roy hasn’t been feeling well and he braved his sickness and the weather to join us. Thank you! Also a massive shout out to the members of the team, and my friends and supporters. You all mean the world to me. Regardless of the election vote we will be back again next week. Please can I ask you to please use your vote? The amount of people suffering is unbelievable. Please share my blog, talk about it, donate if possible. Every penny helps. This has unfortunately become a full time job for me and I really need to continu this vital work. Thank you! Today’s demo. WASPI ladies visiting the Jobcentre, queue for food parcels again. Today’s demo. Queue for food parcels, hungry people. 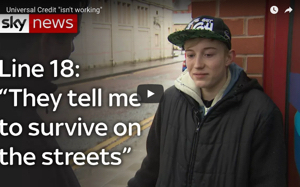 Universal Credit hell. 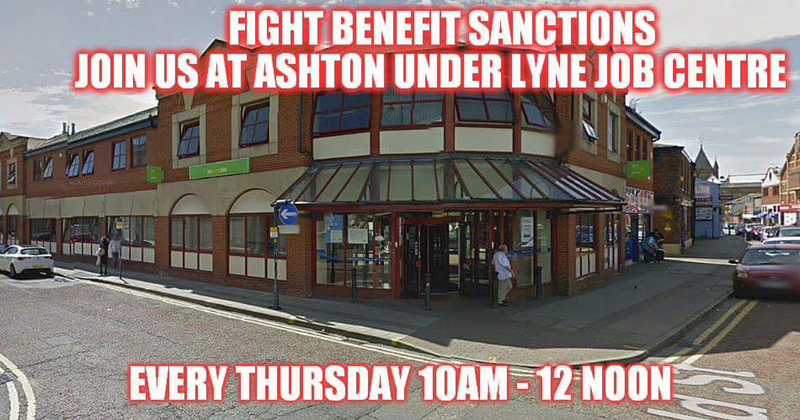 Welcome to Ashton Under Lyne Jobcentre. Like every other job it is time related, in that you start at X time and finish at Y time and are expected to have covered a route of so many miles. Would any employer employ a person who would slow a team down? I don’t think so! I would just do it to piss them off but mention the disability and ask what adaptions they have to take into account the need to use crutches? I would also have taken their name before leaving JCP, , asking if they didn’t have a name tag on, and I wouldn’t settle for just a first name, anything like Dave there is only me here with that name, I’d want a surname as well then put in a complaint about their demand to apply for a totally unsuitable job. I would also tell them that a prosecution is pending.